A proprietary technical and economic model was used to determine the optimal sizing of a grid-connected PV-BESS (solar PV and battery energy storage system) combination for a mine under development and located in the Northern Cape. This article presents the analysis of grid parity dynamics based on the levelised cost of electricity (LCOE) concept to examine the timings and conditions for a PV-BESS to reach grid parity. PV systems have developed over the last few years into a highly competitive power generation option. Energy from PV is however not fully dispatchable and is subject to the intermittency of solar irradiation. These challenges can be addressed with BESS systems. Battery technology and manufacturing capacity have developed rapidly in recent years mainly driven by e-mobility. BESS costs have reduced to levels where PV plus Battery can provide dispatchable power at competitive prices. One noteworthy example is the world’s largest BESS at Hornsdale Power Reserve in South Australia. The 100 MW/129 MWh BESS is co-located with a windfarm and additionally provides exceptional high-speed ancillary services to stabilise the grid. The advancement of BESS technology and continued cost reductions in PV and BESS, lead to the forecast that a growing number of high energy users such as mines or grid operators will find it beneficial to opt for energy or ancillary services from PV-BESS hybrid systems . Fig. 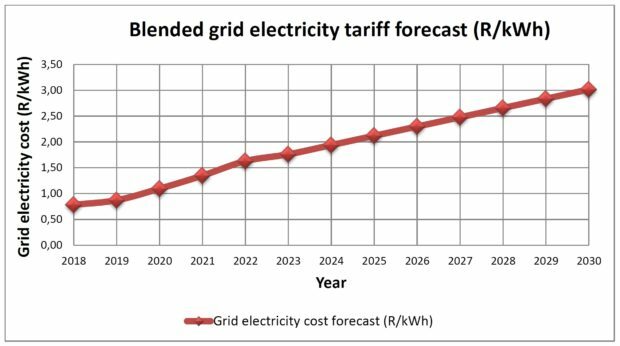 1: Blended grid electricity tariff forecast for the mine (2018 to 2030). After the successful construction and commissioning of the award winning and world‘s largest fully off-grid solar-diesel-and-battery storage plant (10,6 MW PV coupled with 6 MW of battery storage and 19 MW of diesel) for the De Grussa Copper-Gold Mine in 2016, the company has seen significant interest in hybrid systems from the commercial and industrial sector – most specifically, the mining sector. In a cost and SWOT analysis study conducted by Zharan, regarding the integration of renewable energy (RE) sources in the mining industry, a research finding from Navigant shows that the number of mining projects that will utilise renewable energy technologies for its operations is set to increase. Navigant reports that by 2020, mining operations worldwide will deploy more than 1438 MW in RE . This equates to an expected deployment of 500 MW RE projects for the mining industry in the next 2 years. Fig. 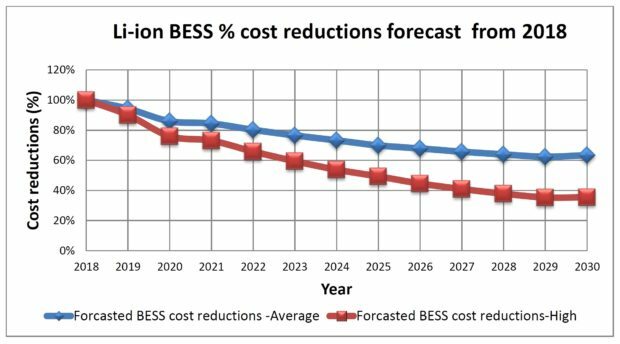 2: BESS percentage cost reduction forecast (2018 to 2030). This article presents the preliminary findings from an ongoing case study being performed on a hypothetical mine to determine the most economical, secure and environmentally sustainable solution for the energy needs of this mine. The mine seeks to incorporate renewable energy sources into its planned energy mix while maintaining security of supply at the lowest possible tariff and to mitigate future electricity price risks from the grid. The study used a proprietary technical and economic model for the optimal sizing of a grid-connected PV-BESS solution for the mine situated in the Northern Cape with an estimated life of mine of 13 years and an average load demand of 35 MW. Various studies have shown that an increase in stability and security of supply from renewable energy sources can be achieved by incorporating a storage component [2,3]. However, due to the historically high cost of batteries or other storage technologies, the timing of adding energy storage needs to be well considered. This study utilises proprietary software designed to simulate the operation of a hybrid system by making energy balance calculations in each time interval of the year and then determines feasible configurations under the conditions specified and estimates the net present value (NPV) of installing and operating the system over the lifetime of the project from which the least cost of energy (LCOE) is calculated. Fig. 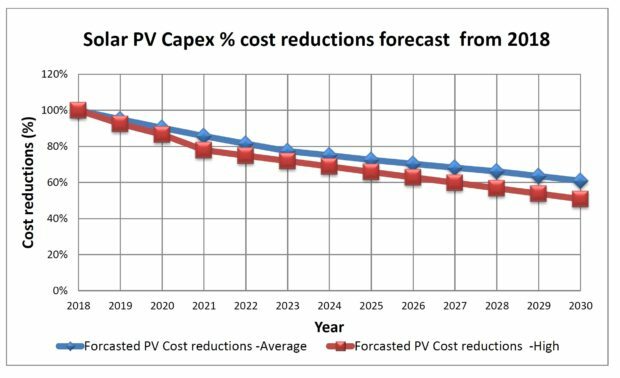 3: Solar PV capex cost reduction forecast (2018 to 2030). For this analysis, it is important to note that the simulations used in the model only takes the energy shifting function and the associated revenue stream into account. As such, this LCOE analysis does not consider any additional revenue streams that batteries are able to generate such as ancillary services, peak shifting, frequency controls or other ancillary services or energy sale to the grid via price arbitrage. Additionally, the study did not include carbon taxes which might have to be paid by the mine for its emissions. The software defines the LCOE as the average cost per kWh of useful electrical energy produced by the system. The simulation considers three main inputs: forecasted reductions in PV system capex cost, forecasted reductions in BESS cost and the forecasted increments in Eskom’s grid electricity tariffs for the mine between 2018 and 2030. The PV and battery storage systems costs applied in this study were based on current local and global market prices, selected market research and price forecasts and assumptions. These prices were then estimated over the project period based on the forecasted trend cost reductions of PV and BESS from 2018 to 2030 [4,5]. Table 1: General assumptions used in the simulations. The indicative blended tariff that the mine is expected to pay during the “solar day” in 2018 was calculated using the Eskom’s time-of-use (ToU) Megaflex tariffs escalated over the period from 2019 to 2030 based on market knowledge and historic Eskom tariff trends. 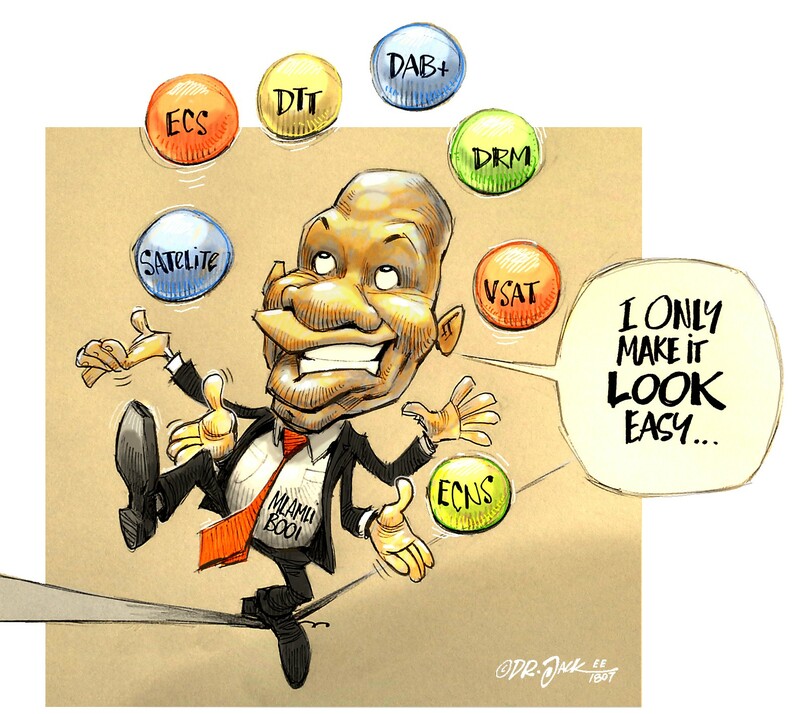 A 12% increase in Eskom’s standard tariff and an 8% increase in Eskom’s standard charges over the years 2019 to 2022  followed by an annual flat increase rate of 8% thereafter until 2030. The cost trend forecasts for the main inputs of the simulation have been represented graphically in Figs 1-3. Figs 2-3 show two trend lines “Average“, and “High“ for the forecasted cost reductions. The “High” represents the most optimistic view of the forecast. All the simulations for this analysis were based on the Average trend forecasts. Fig. 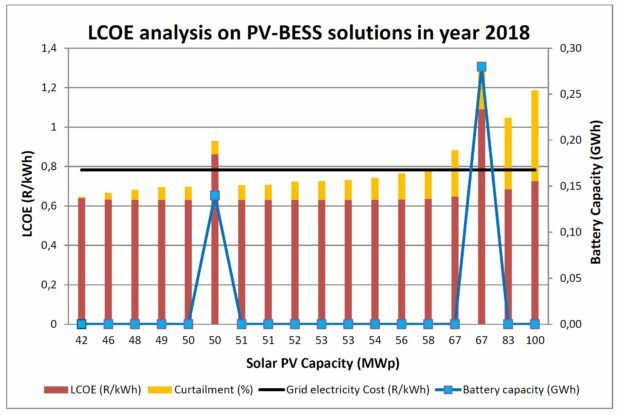 4: LCOE results on PV-BESS solutions with varying battery capacities and their respective curtailments (as at 2018). Based on market prices, a Year 1 (2018) PV system cost for a single axis tracking system with minimal grid connection costs requirements and a BESS cost for a 0,5c Li-ion battery were assumed. Variant I determines the LCOE of grid electricity using Eskom’s ToU tariff and assumed average and peak loads of 35 and 38 MW respectively and operates for a constant period of 24 hours each day of the year. Variant II determines the LCOE of for the PV system only. Variant III determines the LCOE for the PV-BESS solution. For each variant, simulations were run for the period between 2018 and 2030, with the aim to determine which year the PV-BESS would make economic sense for the mine relative to the grid electricity tariff. Additional input assumptions for the simulations have been provided in Tables 1 and 2. The key observations from the simulations have been summarised in the Figs 4-5. These illustrations highlight the most economical solutions identified between the years 2018 and 2030. From the results of the simulation, it can be concluded that it is already economical for the mine to incorporate solar energy into its energy mix to supplement a percentage of its current annual energy requirements. PV-BESS systems become economically viable in the year 2023. Today, the mine could opt to install an optimal size of a 41,67 MWp solar PV system to supplement 33% of its annual energy requirements with a 1% curtailment of the energy produced, at an LCOE of R0,6397/kWh as against the grid electricity cost of R0,7824/kWh. The results also show that it is cheaper for the mine to install PV capacity below 100MWp at an LCOE ranging between R0,6397/kWh and R 0,7259/kWh at an energy curtailment ranging between 1 and 46%. However, any PV only option will be associated with a higher risk of security of energy supply, given the intermittencies associated with the solar energy resource. Nevertheless, as Eskom’s grid electricity cost continues to increase in the subsequent years after 2018, and PV systems and BESS costs continue to decrease, solar PV-BESS solutions become economical by 2023. It is important to note that this simulation was based on the average trend of forecasted cost reductions for the PV and BES systems represented in Figs 2 and 3. 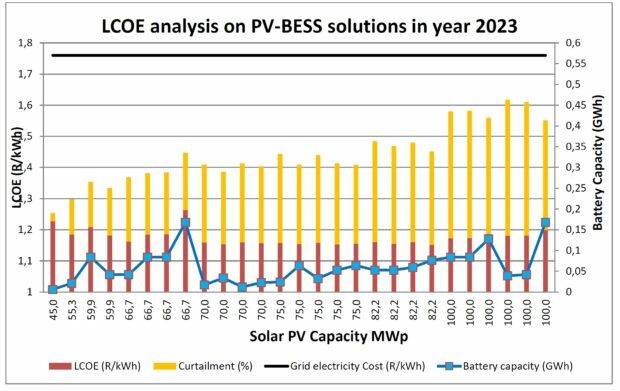 On that note, it’s worthy to note that PV-BES solutions for the mine could achieve grid parity earlier than 2023 if the PV and BES costs reductions follow the “High” trend. Fig. 5: LCOE results on PV-BESS solutions with varying battery capacities and their respective curtailments (as at 2023). To increase the RE share of the mine’s energy mix, the PV capacity should be increased above 41,67 MWp. However, without a storage component, the additional energy that will be produced from the any additional PV will be curtailed as excess energy unless there is a sudden increase in the demand for energy at the mine. Hence, the addition of a BESS becomes vital to store the excess energy that will be produced from the PV system for later use or to supplement any shortcomings from PV due to cloud cover. For instance, the results show that in 2023, to increase the RE percentage above 33% the mine could install an optimal 82 MWp system with a battery component of about 33 MW/76 MWh battery a 30% curtailment of energy. The LCOE of this system is calculated to be R1,1515/kWh which was found to be the most economical solution as compared to the estimated grid energy cost of R1,7600/kWh for the year 2023. The battery system will only be able to cover shortcomings from the PV side during a cloud cover day but cannot provide enough power to serve the load demand of the mine in the event of a full grid outage. For full back-up functionality, a BESS would have to be adequately sized to serve all critical loads. Using different battery inverter sizes, additional simulations were run with the attempt to determine if the mine could go off-grid in 2023 at a solar energy cost at grid parity. The study showed that a complete off-grid solution would not be an economic solution for the mine. Table. 2: Results of simulations with various PV and batteries. For the same PV capacity of 82 MWp, with a higher battery capacity such as 40 MW/103 MWh this battery system is well suited to provide security of supply in events where the mine experiences power outages for a period of 2,5 h. The LCOE of this system calculated to be R1,1617/kWh as compared to the 2023 estimated grid energy cost of R1,7600/kWh. As the battery cost continues to decrease, the battery capacity can be increased to store enough energy to take the mine completely off the grid. Additional observations include; comparing a 67 MWp to a 100 MWp system coupled with the same battery capacity of 38 MW/84 MWh the RE contribution from both systems were calculated to be 41,91 and 46,40% respectively with an energy curtailment of 20 and 41% at an LCOE of R1,1845/kWh and R1,1727/kWh respectively. The model calculated net present value of these two systems as R3,28-billion for the 67 MWp systems and R3,25-billion for the 100 MWp system. This implies that when designing a PV-BESS for 2023, when PV-BESS would become an economic option, with the same battery capacity, it is most economical to opt for a larger solar PV plant capacity despite the resulting high percentage of energy curtailment. Larger PV plants yield a cheaper NPV, lower LCOE and provide a higher RE contribution. Fig. 6: CO2 emissions savings analysis. Additional benefits from implementing RE into a mining operation are the reduction of CO2 emissions from the mine, and reduced price risk exposure. RE system prices and resulting electricity prices are capex driven and as such reduce the mine’s exposure to grid electricity or fuel price volatility. 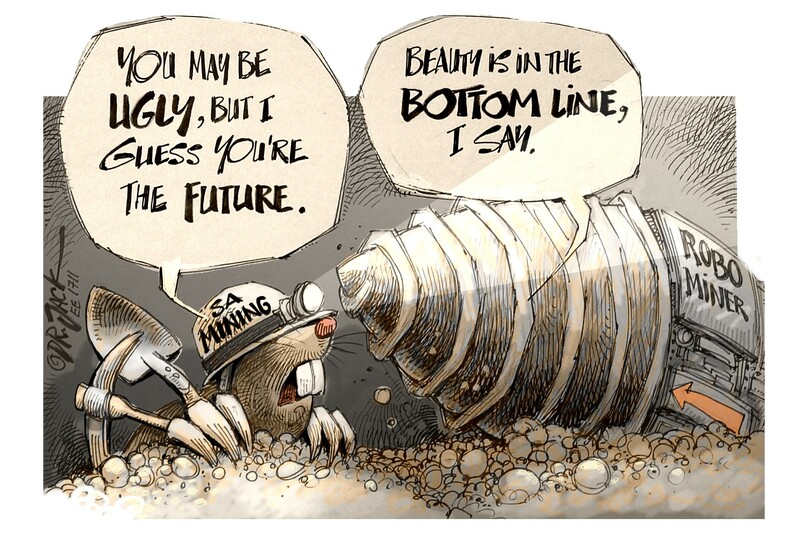 Based on a grid emissions factor of 0,94 t CO2 e/MWh for South Africa, it is projected that for an 82,22 MWp PV plant with a battery storage capacity of 33 MW/76 MWh commissioned in 2023, the carbon emissions reductions for the mine is estimated to be about 132 916 tCO2/year which is about a 46% reduction in the estimated emissions compared to pure grid supply. Assuming constant energy requirements for the entire life of the mine, this system will also result in a 34% electricity cost savings of R1,36-billion over the operational period of the project. Based on Eskom’s Megaflex electricity rates, the mine’s energy demand and the given location, a PV power plant behind-the-meter provides substantial cost and CO2 savings. 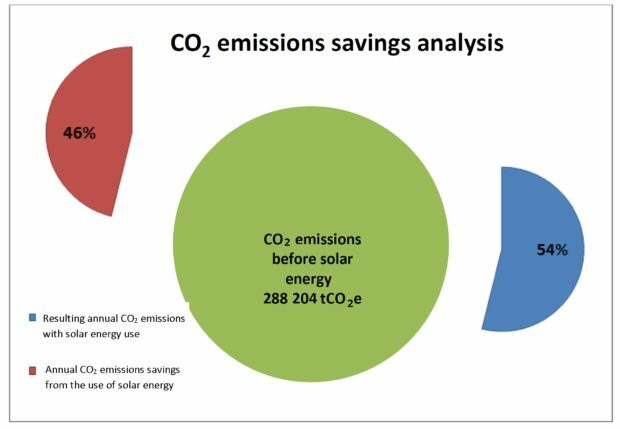 For a 42 MWp behind-the-meter PV plant in 2018, the estimated cost and CO2 savings over the lifetime of the project is R2,45-billion which is equivalent to 61% of the grid electricity cost and a 33% CO2 savings of 95,439 tCO2e per year. BESS however have not yet reached grid parity but is fast approaching it and might do so by 2023. This is only a preliminary assessment; a detailed and in-depth analysis is required for each site, tariff and revenue structure to conclude an appropriate technology mix PV-BESS or other renewable energy resources such as wind. K Zharan and JC Bongaerts: “Decision-making on the integration of renewable energy in the mining industry: A case studies analysis, a cost analysis and a SWOT analysis”, Journal of Sustainable Mining, 2017. B Sørensen: “Renewable energy conversion, transmission, and storage”, Elsevier, 2007. M Bahadornejad and N Nair: “Solar PV, Battery Storage and Low Voltage Distribution Network: A discussion on the Benefits of Distributed Battery Storage”, Power systems group, University of Auckland, 2013. Bloomberg NEF: “BNEF’s Annual Long-Term Economic Analysis of the World’s Power Sector Out to 2050”, New Energy Outlook, 2018.